Portobello Business Centre - Why Am I Me? 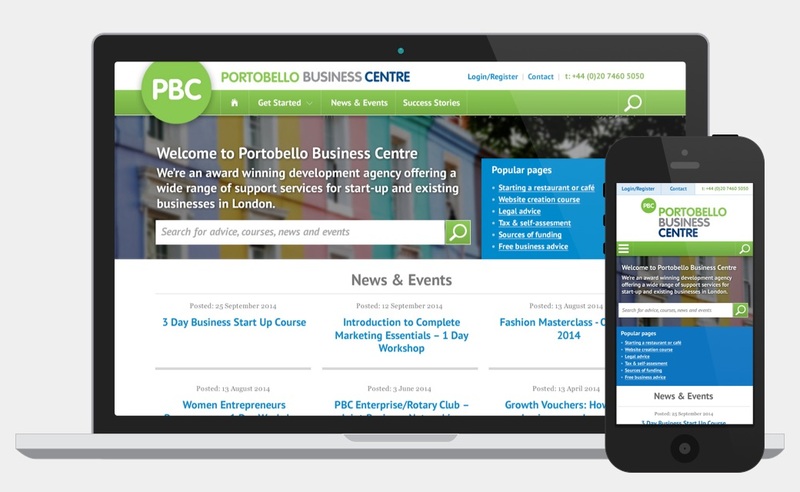 Website design for The Portobello Business Centre, an award-winning development agency offering a wide range of support services for businesses in London. I created design mock-ups for The Portobello Business Centre to make the layout of their website less cluttered and easier to navigate. This included the addition of a search facility to allow users to search for specific content rather than navigate through textual links. The homepage features a banner containing a search form with a background image of iconic local residencies which provides extra visual impact. In addition there are textual links to the most popular pages on the site so they are easy to reach. News items, currently displayed in full, would now be listed in a grid on larger screens or as a linear list on smaller devices like mobiles. The news items contain the date and title with a brief excerpt that appears on mouse over or focus event, allowing the content more space and making it easier to read. The current website features a left hand column with a large number of links. These have been moved into a jumbo drop down under ‘Get Started’ in the main navigation to make the page much cleaner.